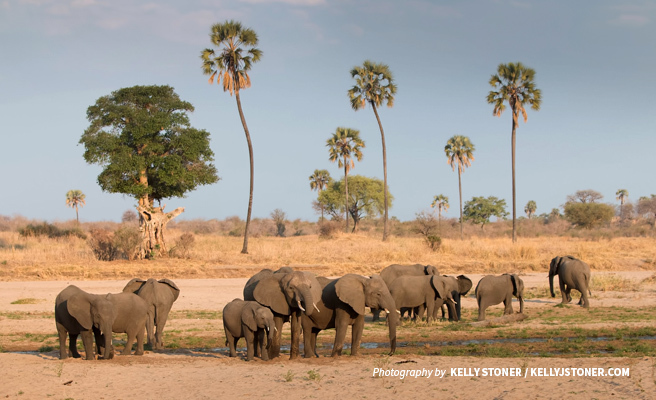 Ancient elephant migratory routes run through southern Tanzania’s Kilombero Valley, which is part of a dense cluster of wetlands and forests and in the Great Ruaha River Basin and a designated Ramsar site — a distinction bestowed on internationally important wetlands. Allowing elephants and other large mammals to move between protected habitats like the Udzungwa Mountains National Park and Selous Game Reserve, wildlife corridors and dispersal areas are critical in maintaining species health. However, these access routes often cut across large commercial plantations as well as smallholder farms sprawled across the valley’s fertile highlands. For villages close to protected forests in the Kilombero Valley, it is not uncommon for farmers to wake up to their fields foraged by large mammals. Continual crop losses carry serious economic consequences for subsistence farmers and defending farms and homesteads from damage sometimes results in retaliatory wildlife killings, particularly of elephants that break fences and trample farms as they consume crops. African Wildlife Foundation supports the Southern Tanzania Elephant Program to deliver cost-effective and sustainable conservation solutions to mitigate human-elephant conflict as part of the Sustainability and Inclusion Strategy for Growth Corridors in Africa (or SUSTAIN-Africa) program in partnership with IUCN. Affected villages in the Kilombero Valley are embracing non-violent measures like the beehive fence to deter elephants. Not only are farmers empowered to secure their livelihoods, but they are also protecting local wildlife. Based on the fact that bees — particularly the aggressive African honey bee — repel elephants, the Southern Tanzania Elephant Program installed an innovative fence with built-in beehives along the boundary of the Udzungwa Mountains National Park. It is placed 10 meters outside the south-western border of the national park, where elephants are known to cross into farmland. Shielding a string of small farms on the opposite side, the 500-meter fence was built in late 2011 following the Beehive Construction Manual developed in Kenya. The design is simple — at 10-meter intervals, a top-bar beehive (with a roof to protect it from the sun and rain) is suspended by strong fencing wire between two wooden poles. The beehives are designed to swing on the wire, working up the bees when an elephant disturbs the fence as it tries to get into farmland. AWF worked closely with the Southern Tanzania Elephant Program and local villages to introduce the beehive fence technology and beekeeping skills to identify farms facing high elephant encounter rates. In 2014, a farmers group and members from the Southern Tanzania Elephant Program extended the fence to the north by 600 meters with an additional 87 beehives. Studies assessing the extent of human-elephant conflict in the area have found that retaliatory killings of elephants stand at zero since the fences have been installed. Local monitors trained through the program continue to gather information on elephant behavior and crop-damage incidences. One village reported elephants leaving the neighboring Magombera Forest but did not record any damage to crops — in some cases, elephants turned back at the fence. By reducing crop-raiding, farmer’s yields are higher, ensuring food security and a reliable source of income. Beekeeping also boosts the resilience of farmers. 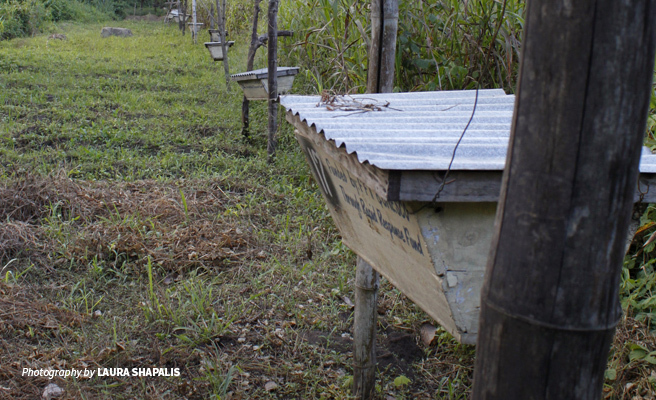 Targeting over 60 affected households through three farmer organizations, AWF provides beehive fence construction materials as well as financial and management training. 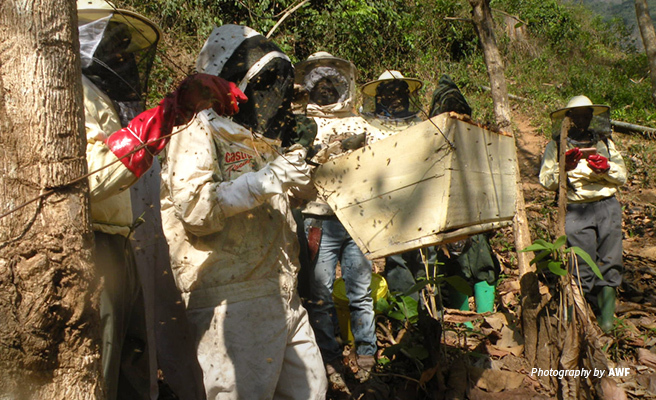 AWF established the Udzungwa Honey Collection Center to coordinate processing, packaging, and storage of honey. All three farmer groups also received support to construct a commercial beekeeping hut with 20 hives to protect bee colonies from dry season conditions. Apart from increasing honey production, the additional hives provide a source of bees to colonize the beehive fence. Farmers groups also have access to high-end markets, with branded elephant-friendly honey already sold in supermarkets and supplied to tourist camps in the Udzungwa Mountains National Park. The farmers groups pool their profits from beekeeping to operate Village Savings and Loans Associations. Members receive yearly dividends that contribute to farm costs and help them support their families. They can also apply for seed capital to invest in other income-generating activities — some have ventured into while others opened small restaurants and tailoring shops. As a community-driven conservation solution, beehive fencing technology stands out as an innovative way to mitigate human-elephant conflict and improve local livelihoods. At the Nane Nane Exhibition in August 2018, a week-long agricultural showcase held across various regions in the country, Tanzania’s Minister of Agriculture and Cooperatives ordered the transfer of beehive fencing knowledge to communities around Serengeti National Park. Through AWF’s implementation of the SUSTAIN-Africa program in the Kilombero Valley, not only are community livelihoods secure but essential ecosystems are also protected. Partnering with Reforest Africa, we have engaged communities to restore the Magombera Conservation Area which secures an important wildlife corridor. Each village has provided 1 hectare to plant native tree species, helping connect the Udzungwa Mountains National Park, Magombera Forest, and Selous Game Reserve. The Ruipa Wildlife Corridor is another critical ecological zone in the Kilombero Valley. Here, AWF has helped install beacons to demarcate the boundary of the Namwai Forest Reserve, a community forest recovering from years of degradation. By developing forest management agreements and land-use plans with neighboring villages, local government authorities, and wildlife management agencies, AWF creates a foundation for conservation-centered development in southern Tanzania for the long-term survival of wildlife and the benefit of local communities. Fadhili Njilima is African Wildlife Foundation's Community Development Officer based in Ifakara, Southern Tanzania. He is a Conservation Geographer with extensive experience and knowledge on ecological monitoring, especially of vegetation, birds, and primates. Fadhili has coordinated various conservation projects in Tanzanian biodiversity hotspots and famous national parks. He is a passionate conservationist with a keen interest in advocating, lobbying, and defending biodiversity protection.